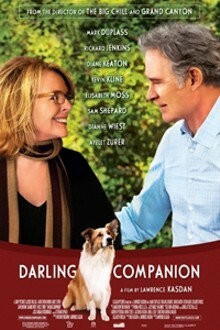 In Darling Companion, Beth saves a bedraggled lost dog from the side of the freeway on a wintry day in Denver. Struggling with her distracted, self-involved husband Joseph and an empty nest at home, Beth forms a special bond with the rescued animal. When Joseph loses the dog after their daughter's wedding at their vacation home in the Rockies, Beth, distraught and angry with Joseph, enlists the help of the few remaining guests, Richard Jenkins, and a mysterious woman in a frantic search. Darling Companion is not showing in any theaters in the area.